Top Dating Sites India - Online Dating 101: What Do Indian Ladies Look For In A Man? Online dating in India has been more popular than ever so it’s no wonder more and more women are turning to this form of meeting new people when searching for a partner. In general Indian women are not that different from any other ladies around the world when it comes to the desirable traits in their husbands. Thanks to an enormous number of users of online dating sites in India they can pick and choose who to date and hopefully build a home and a family with one day. Dating different men over a short period of time might feel a little unpleasant, but most Indian ladies know that’s what it takes to find the one. Let’s take a closer look at what Indian women want to see in a man when joining an online dating site. Most Indian women definitely seek stable men that are dependable and reliable. Women appreciate stability because it gives them a sense of security, which they need when building a future with a life partner. Building a home and starting a family with someone who is not yet established can be a real gamble, so men with stable jobs and steady incomes are pretty much marriage material. Men who are mature enough to take care of their women and who are ready to settle down can do absolutely great on online dating sites in India as most of the female users are searching for someone just like that. There is nothing worse for a lady than a disloyal man with a wandering eye. Although it’s tough to say who’s loyal and who isn’t based on a dating profile, there are still several things that give it away. Men who know loyalty will probably post photos with their best friends, who appear time and again on loads of their pictures. Men who are loyal also don’t brag about their conquests on their profiles in any way, and don’t seem to be womanizers. Most importantly, dating someone in the offline world will best show how loyal they are. 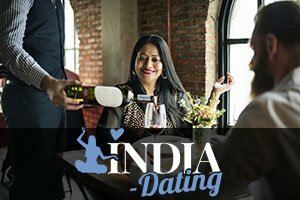 In order to do this Indian women need to be prepared to go on as many dates as possible until they find someone who meets their criteria. Well-raised Indian women definitely want a man they can take home to meet their parents. Being nice and mild-tempered goes a long way, while men who are hasty and impulsive are far less desirable. Although having good manners might not be as transparent from an online dating profile, women can still tell who seems to be nice and who’s a wild party animal only looking to score. Getting dates on Indian dating sites means showing one’s suitable for a long-term commitment by showcasing family-oriented values. Indian women still highly value tradition, and their soulmates need to be marriage material, and nothing says marriage material quite like a stable, loyal and well-mannered man.